Dental emergencies and accidents are common. If treated correctly and timely, the tooth can often be saved. 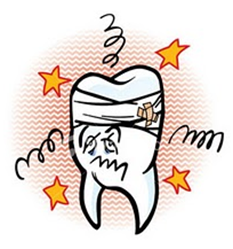 Dental emergencies usually involve severe dental pain. It is not a broken tooth or a tooth ache that has been persisting for a couple weeks, but rather a quick onset of severe and unrelenting pain. If a dental emergency occurs during normal working hours, we will ensure that you can be seen within a couple of hours of you calling us. If your pain occurs on a weekend or overnight, we have an after hours emergency number you can call. This number is available on our answering service when you call the surgery on 07 3491 8131. Where possible we recommend that you take some mild pain relief until our office opens again. Dental emergencies are usually the result of a serve infection or abscess that has formed in or around the tooth. It may be a new infection, but often it is a result of decay or gum disease that your dentist had previously identified as needing treatment. Many people choose to delay treatment until it 'hurts', but this is not advisable. Dental decay or infection will 'blow up' at the most inconvenient time. It is painful and often advanced enough to require root canal treatment or extraction. At Gerber Dental Group we advise that prevention is better than cure. Regular preventive care appointments and early detection and treatment of any decay and infection gives a very good chance of saving your tooth, avoiding sudden pain and reducing the cost of complex treatment. Dental accidents are the most common cause of dental problems for children and teenagers behind decay and gum disease. Mouth guards MUST be worn during any highly active or contact sports. Your teeth are too valuable to risk and leaving them on the football field is both a painful and expensive exercise. Mouth guards should be made by your dentist rather than purchasing an 'off the shelf' or 'do it yourself' version. Place your tooth in cool milk or salt water. DO NOT wash it off or clean it. Get to your dentist immediately - in some cases the tooth can be saved. If the accident occurs after hours, go straight to your local hospital emergency department and request to see an oral surgeon. Call the practice first thing the next working day and schedule an appointment to see your own dentist. Click here for more information about mouth guards.